Feed usually represents the single largest cost in all types of sheep production. A ewe's nutritional needs are not static. What and how much to feed a ewe depends upon many factors, including the ewe's age, weight, and body condition, along with her stage and level of production. Climate, exercise, and disease can also have an effect on her nutritional requirements. A wide variety of feedstuffs can meet the nutritional needs of ewes during their different production stages. There is no one perfect feeding program. The choice of feeding program will depend upon geographic region, when lambs are born, and the cost and availability of feedstuffs. Feeding the ewe so she is gaining weight about 2 weeks before breeding is called flushing. Flushing may increase lambing percentage by increasing the number of eggs that the ewe ovulates. Flushing works best on thin ewes (BCS < 2.0). Ewes that are already in good body condition (BCS > 3) usually do not respond well to flushing. Flushing has more effect early in the breeding season. Flushing may also be beneficial late in the breeding season. Mature ewes respond better to flushing than yearlings. You can flush ewes by feeding them 0.5 to 1 lb. of grain per day or by moving them to a better quality pasture. If flushing is continued through the breeding season, it may enhance embryo survival during early pregnancy. Ewes should not be bred on pastures that contain a high percentage of legumes. Clovers (especially red clover), alfalfa, and birdsfoot trefoil may delay estrus. Fescue grasses, as well as barley grain and oat grain also contain compounds with estrogenic activity. Estrogenic compounds are present in varying concentrations in most all legume plants during the entire growing season, though not when the plants are mature and dry. Early to mid gestation is a critical period in the ewe's production cycle because placental development occurs from day 30 to day 90 of gestation. Placental size or weight affects nutrient transfer between the ewe and the her fetuses. Underdeveloped placentas result in lower birth weights regardless of late gestation nutrition. While the ewe's nutritional requirements during this period are not significantly above maintenance requirements, 21 days of severe underfeeding or 80 days of moderate underfeeding can affect placental development. Good nutrition during late gestation will help to ensure a successful lambing season. Knowing how much to feed ewes during late gestation can be difficult because it depends upon the number of fetuses the ewe is carrying. Underfeeding will result in the birth of small lambs. Small lambs are less resistant to cold stress and will have slower pre-weaning growth. 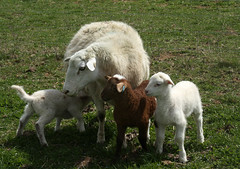 Most of the ewe's mammary development occurs during late gestation. Underfeeding will reduce the yield and quality of milk, including colostrum. Overfeeding can result in oversized fetuses. Big lambs increase lambing problems and have a higher mortality rate. The nutrients that are important during late gestation are energy, protein, calcium, selenium, and vitamin E. The amount of energy required depends upon the number of fetuses the ewe is carrying. Cold stress increases nutritional requirements, especially if ewes are kept outside. Winter lambing ewes usually cannot consume enough forage to meet their energy needs. More energy is required two weeks before lambing versus six weeks before lambing. Ewes carrying singles do not need to receive grain as early as those carrying multiple births. Pregnancy toxemia (ketosis or twin lamb disease) is a common disease in late gestation. It is caused by an inadequate intake of energy during late gestation, as fetuses make 70 percent of their growth during this period. 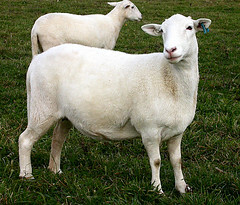 As the ewe breaks down her body fat to meet her increasing nutritional needs, toxic ketone bodies are produced. The ewes that are most prone to pregnancy toxemia are fat ewes, thin ewes, old ewes, timid ewes, and ewes carrying multiple births. Treatment is aimed at increasing blood glucose level. In advanced cases, a caesarian section may be necessary. Milk fever is different in sheep as compared to dairy cattle in that symptoms occur pre-lambing. Simply states, milk fever is low blood calcium (hypocalcemia). It is caused by either inadequate intake of calcium (usually) or the inability to mobilize calcium reserves. The clinical signs of milk fever are very similar to pregnancy toxemia. Differential diagnosis is based on the affected ewe's response to calcium therapy. Vaginal prolapses tend to occur more frequently in fat ewes or ewe lambs carrying multiple fetuses. There is simply not enough room for everything. . 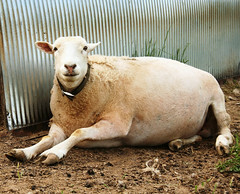 Preventing ewes from becoming overfat and limiting intake are two ways to reduce vaginal prolapses. Lactation places the greatest nutritional demand on ewes. How much you feed a ewe will depend upon how many lambs she is nursing, her size and condition, her age, and the time of the year the lambs are born. Ideally, ewes should be separated into production groups and fed according to the number of lambs they are nursing. 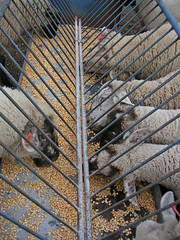 A general rule of thumb for concentrate feeding of lactating ewes is 1 pound of grain for each lamb nursing the ewe. 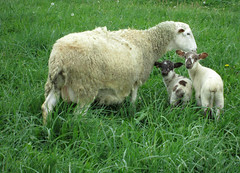 On pasture, ewes rearing triplets should be given access to more forage. Supplemental feeding may be advisable. Protein and energy are both critical nutrients for milk production. If either nutrient is fed below the requirement, milk yields and lamb gain will be reduced. After the first 60 days of lactation, you should reduce the amount of feed you are feeding because all it will accomplish is making the ewes fat. Most ewes will lose weight during lactation. Weight loss during lactation affects protein requirements. The more weight ewes lose, the higher their protein requirement will be. Lactating ewes require a lot of water if they are expected to milk well. It is estimated that lactating ewes require 100 percent more water than non-lactating ewes. 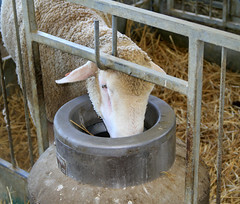 Ewes should have a free-choice supply of fresh, clean water at all times. Heated water bowls should be used during the winter to encourage water consumption. Water bowls should be checked and cleaned on a daily basis. Weaning often takes place at a time when ewes are still producing a lot of milk. In this is the case, grain should be reduced 1 to 2 weeks prior to weaning. For the last week or so prior to weaning, no grain should be fed to the ewes. 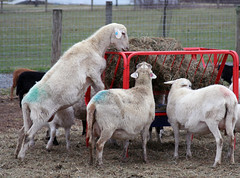 For the last several days before weaning, ewes should be fed a low quality grass hay or straw. After the lambs have been weaned, the ewes should be maintained in dry lot and fed low quality grass hay or straw until their udders start to dry up and recede. 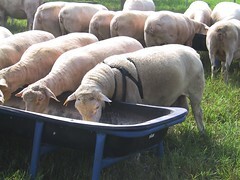 It is not necessary to remove water from ewes at weaning. It can also be dangerous during hot weather. Do not turn ewes onto pasture immediately after weaning. Spring grass is high in protein, water, and other nutrients which promote milk production. The overriding concern at weaning time for ewes is to prevent mastitis. Ewes need to be watched closely during the weaning period for mastitis. Ewes with spoiled udders have decreased or no future production value. In annual lambing systems, maintenance is the longest period in the ewe's production year. Maintenance means the ewe only needs to maintain her body weight or have slow growth to recover the weight (condition) she lost during lactation. 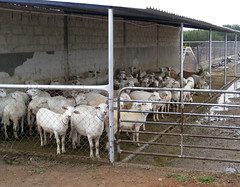 A wide variety of low-cost feedstuffs can meet the maintenance requirements of ewes. Pasture or grass hay is all most sheep need to maintain themselves. Pet sheep or wethers raised for wool should always be fed at a maintenance level. Body condition scoring is a valuable management tool that can be used to evaluate the feeding program and the need for changes. Since there is a wide variation in weight, body condition is usually better indicator of condition than weighing. A body condition score estimates condition of fat and muscle. Both the vertical bone protrusion (spinous process) and horizontal protrusion (transverse process) of the loin are felt and used to access body condition scoring. It is a subjective score. The exact score is not as important as the relative scores and differences between scores. The system most widely used in the US uses a scale of 1 to 5, with 1 being an emaciated sheep, 3 being a sheep in average condition, and 5 being an obese sheep. Half scores are commonly used. On average, 1 condition score is equal to about 13 percent of the live weight of a ewe at a moderate condition score of 3 to 3.5. Most sheep have body condition scores between 2 and 4. A ewe's body condition score will change throughout her production cycle. The three most important times to body condition score ewes are prior to breeding, late gestation, and weaning. Spinous processes are sharp and prominent. Transverse processes are sharp; one can pass fingers under ends. It is possible to feel between each process. Loin muscle is shallow with no fat cover. Transverse processes are smooth and slightly rounded. It is possible to pass fingers under the ends of the transverse processes with a little pressure. Loin muscle has little fat cover, but is full. Transverse processes are smooth and well covered, and firm pressure is needed to feel over the ends. Loin muscle is full with some fat cover. Spinous processes can be detected only with pressure as a hard line. Transverse processes cannot be felt. Loin muscle is full with thick fat cover. Spinous processes cannot be detected. Transverse processes cannot be detected. Loin muscle is very full with very thick fat cover. Source: Body condition scoring of sheep, Oregon State University, 1994. Generally, the better the body condition score is at mating, the higher the ovulation rate will be. However, ewes with body scores over 4 tend to have a higher incidence of being barren. Ewes that have a body condition score of less than 3 at mating will respond better to flushing. Ewes with body condition scores of 3 and 4 at lambing tend to lose fewer lambs and wean more pounds of lambs than ewes with body condition scores of 2.5 or less. A ewe should be at her highest condition score on the day she lambs. This is critical since she is entering her highest nutritional demand. Thin ewes are not able to produce as much or as high quality colostrum as ewes in better condition. Thin ewes do not milk as much as well condition ewes. It is also important to body condition score rams. As with the ewes, thin or fat rams often do not get the job done. Late updated 12-Mar-2019 by Susan Schoenian.